Release 2.x of Project OpenPTK builds on the success of Release 1.x. The goal ... enable developers to create custom interfaces to a variety of repositories ... has not changed. In fact, Release 2.x gives the developer more choices for how they want to create custom interfaces. Release 2.x also supports more back-end repositories. The "core" Framework Tier has also been enhanced to "models", authentication, authorization, pre-actions, post-actions. 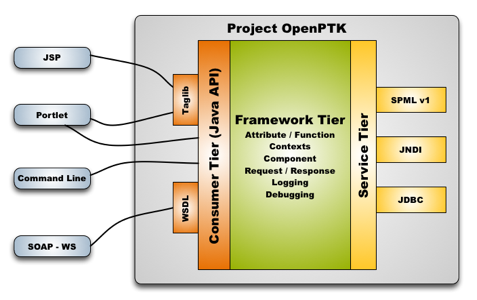 A monolithic design ... the complete OpenPTK architecture is "packaged" with the application. The packaged solution is then deployed as a single unit. Solutions are built using the Consumer Tier, a Java API. A JSP Tag Library was provided to support JSP development. A client-server design ... the "client" communicates to the "server" using a RESTful Web Service. Applications (the client) may only need to package the Client API and they are deployed independently from the server. Solutions can directly leverage the RESTful Web-Service or they can use the Client API.